Whenever we install Sod, it's always cut fresh in the morning from the Sod farm and installed the same day. Our Sod is locally grown and adapted for the climate in Topeka and Manhattan, Kansas. Installing fresh Sod in your yard the same day it's cut ensures the better establishment of the TurfGrass in your yard. ValleyScapes never installs dead or partially dead Sod. Rest assured that your yard will only receive the freshest possible Sod. Sod options we offer are either turf-type fescue Sod or Zoysia Sod. Zoysia is a warm-weather grass and should be installed in late spring or early summer. Fescue is a cool-weather grass and can be installed almost any time of the year, though Fall and Spring are certainly the more ideal times for installing this type of Sod in Northeast Kansas. Many lawns in Topeka and Manhattan have their own unique circumstances regarding the ideal conditions in which to install Sod. We suggest you talk to our specialists to evaluate your new-lawn project. This is one of the key factors for installing new Sod and one of the places where we shine the most. 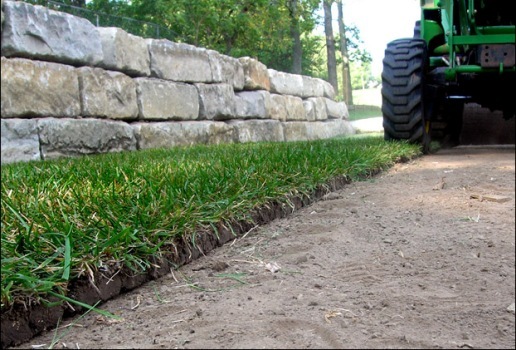 Whereas other landscape contractors may simply roll out new Sod on hard soil (or even on top of existing grass), ValleyScapes thoroughly prepares the soil by tilling, cultivating, pulverizing and grading (as needed). If there are existing grass or weeds, we'll cut them out with a Sodcutter and haul away the debris. When the soil is prepared properly, the new roots from the Sod are going to find it much easier to establish. Sod is truly an investment for your property, so it makes sense to protect that investment as much as possible with effective soil preparation. 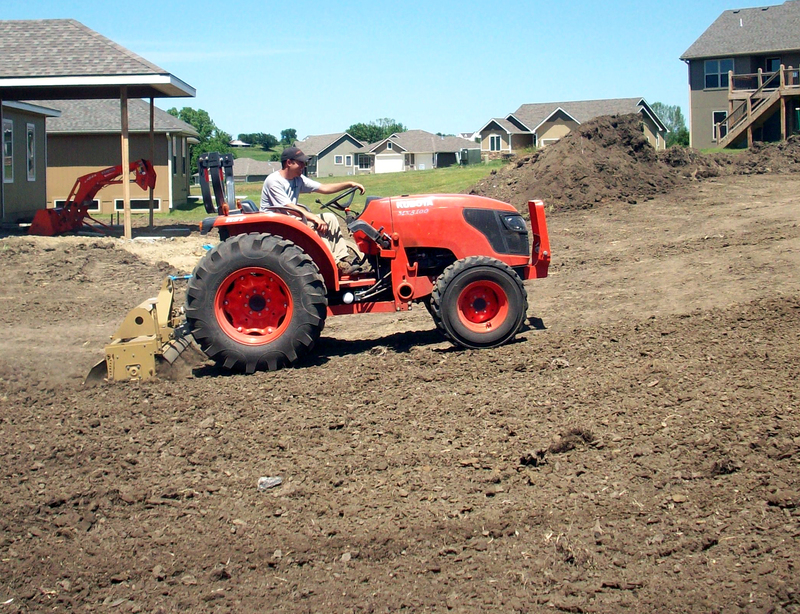 During the soil-preparation phase of the Sod project is also a great time to add soil amendments or fix any grade issues with your property. Most yard drainage problems are fixed with proper grading. ValleyScapes has loads of experience grading yards to perfection. We'll use a laser level, when needed, to make sure the grade of your Kansas yard is done right. Soil amendments are always optional but do increase the nutrients in your soil (making for better Topeka/ Manhattan lawns). Whether compost, topsoil, lime, sand etc is needed, we'll talk about the options available. When soil preparation and grading is complete, we'll install a layer of seed into the soil. When you begin watering your Sod, the seed is in a perfect location under the Sod to stay moist and germinate. This helps you get a thicker and greener lawn in the long run, as the germinating seed will help fill in any seams that may develop between the strips of Sod after they're installed. The primary seeding option is not available for Zoysia Sod installations. 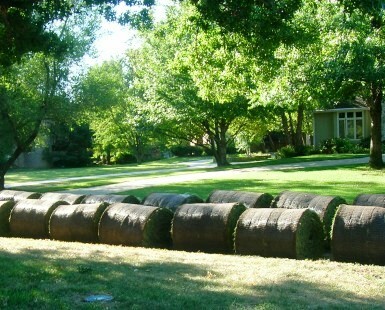 Sod bales are delivered via semi or trailer, depending on the quantity. The Sod is then unloaded and distributed throughout the yard where a tractor can pick it up and roll it out. 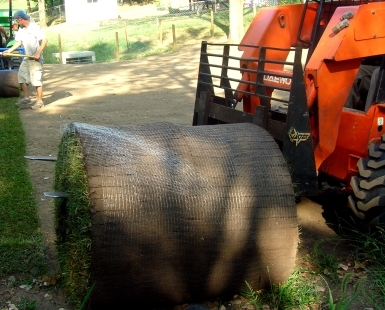 The advantage of using large bales of Sod (as opposed to small rolls you can pick up with your hands) are fewer seams or gaps between the Sod strips. It's normal for Sod to shrink and expand as it goes through the saturation/ drying cycle. Small seams will inevitably develop. But when large Sod bales are used, the strips of Sod are much longer, which means fewer seams for your new Sod lawn. Furthermore, your lawn won't look like a patchwork quilt when we're done. Also, remember, we install seed to help fill in any seams that may develop. *If your yard is too small for large bales or a tractor, we'll cut up the large bales of Sod and install it with hand tools. If your yard is fenced in, and we simply need to remove a fence panel to get tractor access, we'll remove the panel and put it back in place. 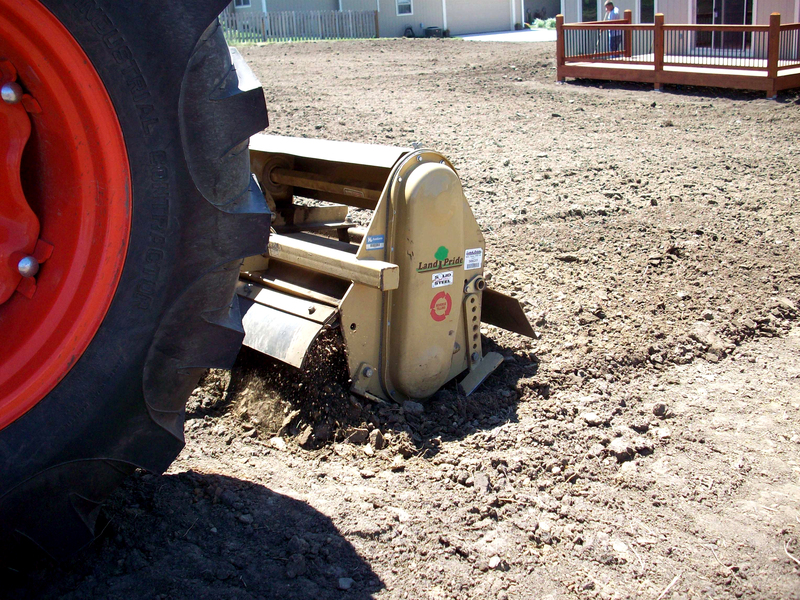 Our tractors do not leave ruts in your yard. Ready to enhance your existing landscape with sod today? What kind of after care do you provide? We'll provide you with unlimited customer support after we install your Sod. Always feel free to email, call or text any maintenance questions with your new lawn; we're here to help. There are general guidelines for caring for new Sod, but each lawn here will require its own customizations. How do I water my sod lawn? If it's hot enough outside, and if water isn't immediately applied after Sod is installed, the new sod can die the same day it's installed. 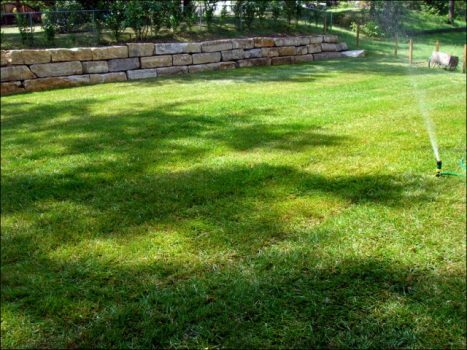 When watering new Sod, you want the water to completely penetrate the layer of sod and saturate the soil underneath. This helps Sod roots dive into the loosened soil beneath and properly establish. Plan on watering regularly for at least several weeks before tapering off. However, this time frame is subject to weather and heat changes. It's pretty rare that we've ever had landscape clients overwater new Sod, but that can also happen. ValleyScapes installs sod (the green side facing up) that has been cut from the Sod farm the same day as installation. Whenever the sod dies for our clients, it's almost always due to lack of enough water (we're talking 99% of the time). It's not our intention to scare you, but it's important that you understand the maintenance procedures before investing in a new sod lawn. How often do I need to mow? Generally speaking, you want to wait until the sod has grown to at least 4 inches before mowing. At this point, use a push mower to cut the TurfGrass, because the weight of rider mowers can disrupt the new-root growth below. Cut the TurfGrass high and bag the clippings (never cut more than one-third of the total growth). After each mowing, give the sod a thorough and deep watering; not doing so can overly stress the new turfgrass roots and cause sod death in hot weather. Clients typically need to observe the above mowing and watering practices for anywhere from one to three months after Sod installation. What are the long-term care needs of sod? ValleyScapes specializes in Turf Renovation. We install new lawns above industry standards and take a heap of pride in doing so. What we do not provide (yet) is a mowing or an annual fertilizer program. Making the investment for a new sod lawn is a great way to beautify your residence, have a place for children and dogs to run around, or simply enjoy your bare feet. When we finish with your new lawn, we have some suggestions for keeping your new sod lawn looking great. Perhaps. What does your heart tell you? Seriously, however, there are some pros and cons. Cons: Cost, lots of initial watering (Sod is easier to water than new seed but needs higher initial volumes of water).